The Welsh Triads named Britain Y Vel Ynys, ‘The Isle of Bees’, which calls to mind a lush green land carpeted in flower meadows, wildwoods abuzz with swarms of honey bees and tree hollows dripping with golden honeycomb. Bees are the epitome of sunshiny days, gliding between summery swathes of wildflowers, filling the countryside and our gardens with their resplendent colours and gentle buzzing. The legendary white sow of Welsh legend, Henwen, in some tales gave birth to three grains of wheat and three bees; both suggest a bounteous land, but honey has been enjoyed by humans much longer than wheat. An archaeological find of a 4000 year-old pot shard reveals that Neolithic people enjoyed drinks made with honey, a fermented alcoholic brew known as mead. In fact, in Britain ‘med’ used to mean both honey and mead. Apart from enjoying their produce, humans have a long spiritual history with bees. ‘Telling the bees’, a ritual practised in Britain and Ireland, entailed speaking to the bees of significant events such as births, deaths and marriages. Forgetting to relay news to the bees had grave consequences and could dry up their honey supply and cause a hive to depart or even die. We are still enjoying honey today, and beekeeping has never been more popular. Despite this, Y Vel Ynys is no more, and bees are much less present in our meadows and gardens than ever before. In Britain bees have significantly declined over the last fifty years, a trend that is mirrored in wider Europe. Bees are a vital strand of the web of life in their role as pollinators, along with hoverflies, wasps, flies, beetles, butterflies and moths. Some plant species rely on bees to pollinate them so that they can produce seeds and fruits, which keeps the ecosystem healthy as well as being an important factor in crop production. Although they are not the only pollinators, bees are an indicator species used to monitor pollinator numbers and the health of the ecosystem. Where bee species are in decline, unsurprisingly, the plant species they pollinate are declining along with them. Factors that negatively affect bee numbers are those same old adversaries; habitat loss, climate change and pesticides. The loss of flower rich habitats such as wild meadows are particularly devastating to bees. From the 20,000 bee species worldwide, there are around 250 bee species in Britain alone. Some of these species are solitary and all the females are fertile and tend to build their own nests. Other species are eusocial, and live in hives. The social structure and hierarchy of bees hives are fascinating. Hives consist of a queen bee, male drone bees and vast numbers female worker bees. The queen alone is the female responsible for reproduction. The male drones are required only to mate with the queen and for every drone there are around a hundred female worker bees, whose tasks include gathering nectar, guarding the hive, protecting the queen and producing honey. Becoming a queen is pot luck: certain cells are designated queen cells and the larvae that hatches here will be fed royal jelly and become the queen. She will only leave the hive once in order to mate. Bees are a fascinating and important part of the natural world, and their declines have long been troubling those aware of their plight. In Britain, Wales is leading the way in addressing the decline of the species and in 2013 The Action Plan for Pollinators was drawn up, with similar plans for England, Scotland and Ireland emerging during the following years. 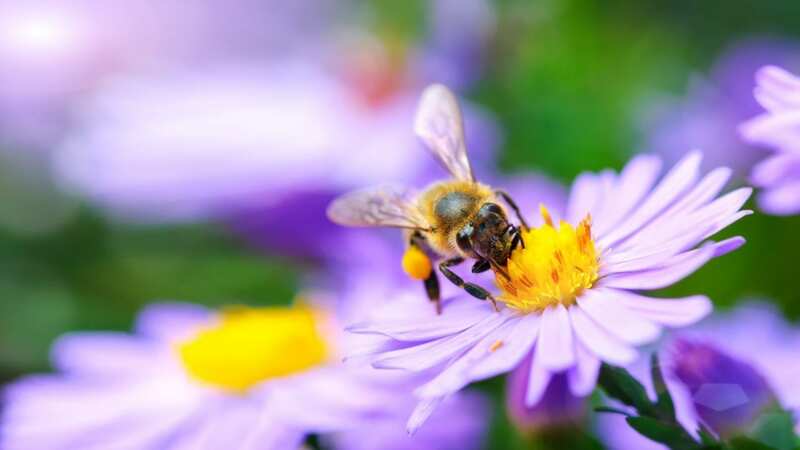 On a smaller scale, individuals can help by planting more bee-friendly flowers in their green spaces, refrain from using chemicals on their own lawns, buying local organic honey and buying or building bee hotels. Bees can get lost, and exhausted or sick bees can be revived by placing a mix of two tablespoons of sugar and one tablespoon of water on a teaspoon and presenting it to the bee. Awareness of the trouble facing our bees is growing, and it is vital that wild spaces continue to increase and flourish so we can give our wonderful stripy friends the best chance to recover.